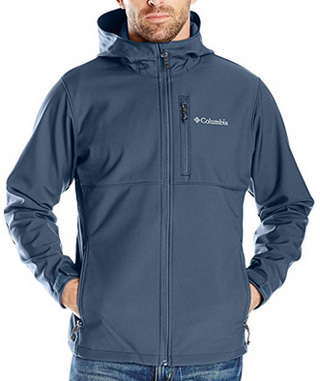 Today we bring you another single review, this time on the Ascender jacket by Columbia. 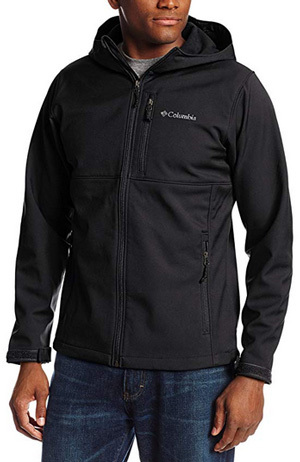 Columbia is an American brand that, along with The North Face and several other brands, are frequently featured in our selections of jackets. This is one of the more affordable brands out there, which also has a high reputation and is renowned for the durability of their products. We chose Ascender because it is a versatile jacket in both performance and style, since it is a softshell in a casual design. Let’s learn some more about it and then see what online buyers have to say about Ascender. As we already mentioned, Ascender is a softshell jacket and as with all softshells, its primary purpose is that of activity performance. More concretely, softshell jackets are designed for comfort during movement, as this type of jacket will not get in the way while you are out there in nature skiing, hiking, mountaineering or just going for a jog. As such, Ascender is a jacket fit for sports. This, provided that the weather is permitting, of course, as it is suitable to wear in mild temperatures and light raining, preferably no rain at all. Because the design is more casual rather than made to resemble a typical sports jacket, Ascender can be worn as a casual jacket, too, over a Tee and a pair of jeans. 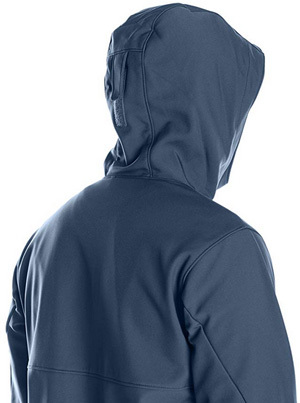 It comes with an attached hood, which can be adjusted with draw cords on each side. The collar is high and there is also a chin guard present, which protects the chin and neck from getting chaffed by the main zipper. Also adjustable are the sleeve cuffs, with Velcro fasteners, and the hem, with inner draw cords. All of these together help to completely close the jacket off and keep you protected from the rain and cold wind, while also locking the heat inside and keeping you warm and cozy. 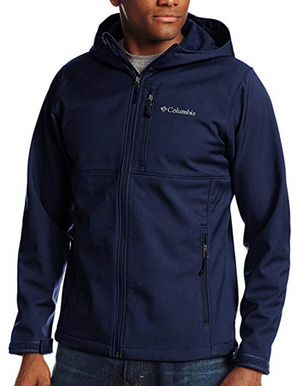 There are no inner pockets on this design, however three zipped pockets can be found on the outside, two of which are placed on the sides and lined on the inside to keep the hands warm, while the third is placed on the left side of the chest. Because of its versatile design, you can wear Ascender almost anywhere. In terms of material, when the name softshell is mentioned, it’s widely understood what that jacket is made of. That is, polyester. The same is true for Ascender, which is made of 100% Polyester both inside and out. 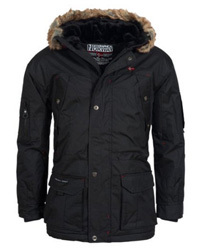 Polyester is durable and water-resistant fabric, as such it is one of the most widely used fabrics for jackets. 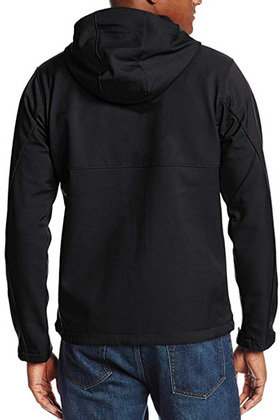 Typically softshell jackets have a fleece interior and so does this design. Fleece is also 100% Polyester, and it is an interesting fabric as it is very insulating, while at the same time it’s quite good at wicking moisture away, which is what is referred to as breathability. 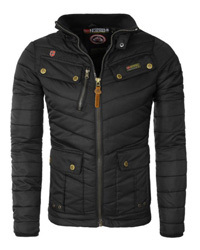 This is a very important quality in any jacket, as it prevents both overheating and wetting out. 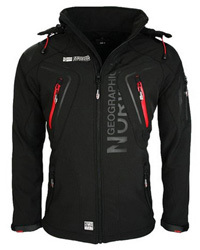 This jacket is a Nexgen Contour Softshell, while the fit is also very comfortable and suited for movement. You might also like: Columbia vs The North Face: Which Brand Is Better? Men’s jackets are notorious for their lack of color options, typically limited to the classic ones. While Columbia does provide a few more colors than most brands do, they usually fall into the category of classy and “neutral” colors, meaning you can wear them with anything. Online reviews in general, are a great way to tell whether what you will get is what you are expecting. In the case of Ascender, which has been reviewed by hundreds of buyers, the overall conclusion is that it does live up to its claims. In terms of weather resistance, it has fared quite well in light rain, each time it has been out in such weather. 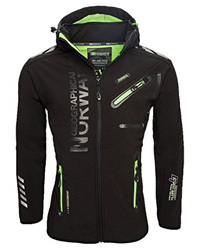 The attached hood, which is not a classic feature of softshell jackets, is also an added plus of this design. The hood is quite big and helmet-compatible, however the adjusting is a bit of an issue as it doesn’t close around the face completely, according to the reviews. You should watch out for that as it might be a hindrance in windy days. Its modern style is also commended, as it allows the wearer to use this jacket for several purposes and is not limited to wearing it solely for sports. Another great quality is its ability to provide warmth, especially since it is lined with fleece on the inside, but it is neither bulky, nor heavy. The only other downside apart from the hood’s tricky design, is the lack of inner pockets, which some users would have preferred to have. 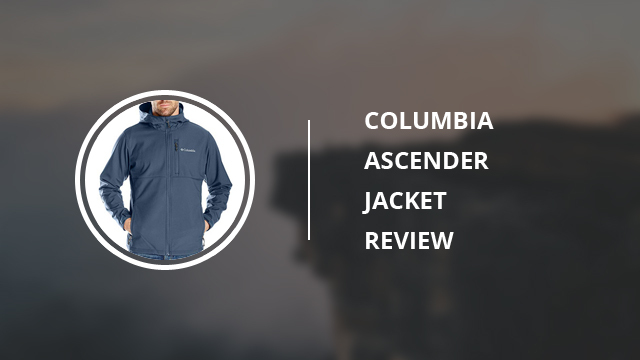 Ascender is one of the few jackets with a majority of ratings commending not only its performance but its style and design, too. It certainly lives up to its claims, therefore if you are looking for a warm, lightly weather-resistant softshell, this is the one.